When most people think of wine tours, Napa Valley in winter does not come to mind. The summer and harvest season are peak times in wine country especially on the weekends. This winter landscape was done in late January at sunset. One of the most popular stops along Highway 29 is V. Sattui Winery in St. Helena. Every time I travel there I find I want to remember the Napa style in a poster or print. This is the result and my poster prints are for sale. Purchase this high quality art print expertly produced on 11x17 inch (28x43 cm) 100% acid free heavy duty premium paper. When matted and framed it makes a beautiful addition to your décor. These prints make wonderful gifts. The printed version you receive is of much higher quality than the web formatted image appearing on your computer screen. The watermark does not appear on the finished print shipped to your home. Click here for more purchase information of my artwork. If you have enjoyed the food and wine on the Napa Valley Wine Train this view looking over the vines would be familiar. The afternoon sunset was bright the day I visited so I set myself up right next to the tracks and began my work as the cars whizzed by at a safe distance. The V. Sattui wines are only available at this location. They do have a good Cabernet Sauvignon and if you are making the trip, a tour of this beautiful Napa Valley winery is well worth the stop because tasting their wine and cheese while visiting the shop is one of the most popular things to do in the Valley. The vineyards in January already are blooming yellow ready for the Mustard Festival and it is not crowded. The valley is located about 50 miles north of San Francisco California. My home is nearby and the Napa Valley in winter is one of my favorite times to visit. The surrounding hills are starting to turn green and the afternoon weather is usually sunny and warm. Discover the beautiful selection of California famous places artwork including Ansel Adams, Lake Tahoe, and the beach. The wine label art tells a lot more than what the wine is and where it came from. Capitola Art and Wine Festival is Fun For The Whole Family in a small ocean side city next to the beach. Click on this Napa Valley map to see winery and restaurant information. Check out the artwork of the welcoming eucalyptus trees along Hwy 12 at the southern gateway to the valley. The sunset view of Twin Palms at the ocean in southern California near a beach house is easy going and colorful. 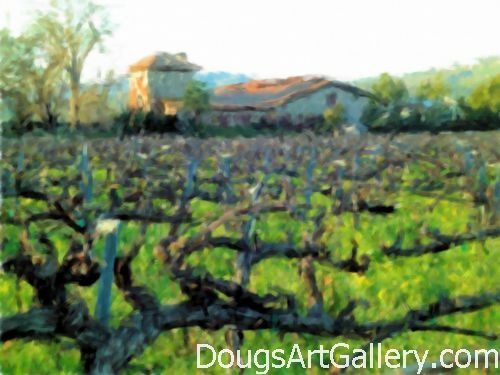 Click here to leave Napa Valley in Winter for more links to artists and their online art galleries, art prints and art posters. Browse the links found at the bottom of Home Page. Do you like the artwork on this page? Please share it so others will find it too by using the buttons below.